. At present she serves México Unido contra la Delincuencia (MUCD) and Transform Drug Policy Foundation (TDPF) as Director of the Latin American Programme for Drug Policy Reform, and is the Latin American “Associate Expert” of the LSE Ideas’ International Drug Policy Project. Called into the drug policy field by the need of urgently stopping the bloodbath caused by the militarisation of drug control strategies in Mexico, she’s been working for eight years now from both the public and the third sector (civil society) to achieve more humane, evidence-based drug policies that do not exacerbate violence and respect human rights. 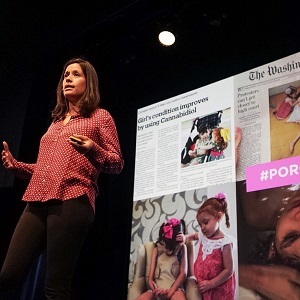 Professionally, she worked for the Inter-American Drug Abuse Control Commission of the Organisation of American States from 2010 to 2012 and has collaborated with several civil society organisations such as Espolea, MUCD and TDPF. As a young activist, she has fought for different causes, ranging from sexual and reproductive health and rights to gender equality, HIV/AIDS and drug policy reform. Summary: Lisa’s answer to the five questions! Listen to the full conversation on the player above; also available on iTunes and Stitcher. I really love this because it has this positive vibe about hope that it’s aspirational somehow. It’s giving you the strength and the courage to continue in a path but not necessarily because you have the certainty that it’s going to turn out well for you or as you imagine but because it’s right. It feels good and you’re convinced that something’s good regardless of the result. It’s positive without being utopic. Many people but if I had to mention just one, it would be my mother. She is the person that consolidates all of these qualities of the definition (of hope). She has been the strongest and most resilient person I have ever met. She has also given me this courage and strength to continue going to where you want to go against all odds. She gave me that powerful sense that no matter what the result, it’s always worth trying and fighting for what you want. I also have an amazing teacher, his name is Juan Carlos Olmedo. This guy was the one that told me that no matter how many people tell you that you should study Finance or Computer Science or Engineering because that’s the future, if you feel like Humanities is your thing just go for that. I wouldn’t be working with as much passion as I work now if I didn’t love what I do. He gave me that hope. In moments I was facing not such a smooth reality, always having these people that believe in you and giving you that particular hope is really what gets you going every single day. That makes me feel much empowered which to me is the core of what we do. Another is Keith Richards, the lead guitarist of Rolling Stones. It’s totally crazy but I’m just so in love with the guy. He is one example of a guy that has been doing what he loves and literally rolling like a stone for five decades doing amazing stuff for the world. I want to have that legacy at the end of my life. Also the former president of Uruguay, José Mujica, the kind of leader that bring an entirely new perspective and fresh air and gives you hope in every sense. I will take my most recent history when you need that extra hope and you need to be that convinced about what you’re doing to keep doing it daily despite the environment. I do advocacy for drug policy reform in a country that’s super engaged in a punitive only strategy against drugs that’s causing a lot of harm. That strategy is quite popular amongst the public. You can see that in countries like the Philippines at the moment in which the president is convinced that drug users and people involved in the drug chain are just not human beings and they don’t deserve proper treatment from the authorities. It’s an argument that wins a lot of support from the public because we have been programmed to think that drugs are bad and that only awful things come out of them. Having every single day to wake up in the morning and try to convince the public of such counter-intuitive argument that actually the war on drugs is much worse than the drugs themselves requires a lot of energy, commitment and hope. I’m convinced that there many other strategies and many other ways of dealing with drugs without saying that drugs are super good, that would be less harmful than the current strategy and global policy. You never know what the result will be because you depend on a lot of political will, the support of public opinion that’s not necessarily educated to think that way, you require a lot of work from your colleagues that are researching to produce the evidence to support that argument. There is a bunch of elements that you need that are not there all the time. It gives you this feeling of never being certain of what the outcome is going to be, yet you are so convinced that this is what someone should be doing and that at some point the entire population will agree with you that you just keep going. Start talking to people, take them by the hand and start showing them not just the numbers and the evidence produced but literally share with them your own story. A story that I love to tell people that are not involved in these political conversations is that when I was born in Mexico City back in the 80s, children like me used to play out on the streets. Children nowadays are restricted of going out on the street because you never know what can happen to them. Then, you can jump into your car and take the highway to Acapulco and now Acapulco is one of the most dangerous cities in the world. Now if I had a teenager who would ask me permission to go to the beach with her friends with no adult supervision, I will be very reluctant to let my child go. That’s what’s happening to an entire generation here in my country. Children are not allowed to be children, teenagers are not allowed to be free and enjoy their country. This is a heartbreaking example of how this war on drugs has militarized the country and has restricted our liberties. These types of violence that are getting so normalized that we see every day on television and hear on the radio, that they made a Netflix original series about, it’s something that’s getting very deep into our minds that we believe that this is something that we need to get used to. By telling these types of stories, I want to transmit what it’s like to fight for a cause that’s not popular and doesn’t have a lot of evidence because many of our institutions have been working for so many decades producing evidence against drugs, but not necessarily evidence of the potential of drugs for medical, scientific or recreational purposes. Every day, I always take the time to speak to the person next to me and just try to figure out what they believe, what they think about the situation that they’re living in and I try to share these stories in order to make them connect at the human level because tragedy has a human face. I also do professional stuff. I research in trying to get the most updated information from countries and other jurisdictions that have tried alternative policies to show to decision makers and the media those evidence and best practices. I also do soft lobbying to convince them to produce better laws. I’m also all over the media explaining a new bill or a new program or a new argument to connect the dots between human rights movement and drug policy movement. (1) Know more by going to websites. If you are in Latin America, go to www.mucd.org.mx or www.tdpf.org.uk. (2) Follow hashtags. Go on social media, google campaigns that have been produced.